At the end of the workshop I attended at Dragonfly Yoga last week, we talked about bandhas. I studied bandhas in my YTT (including reading the definitive book on mula bandha) but it’s not something I usually think much about. In the workshop, Alexis explained that bandhas are a physical lock we can engage in the body that work to channel the flow of energy (or prana) in the body. The most important bandha is the mula bandha, or the root lock (see the link above). Other key bandhas are the uddiyana bandha in the stomach and the jalandhara bandha at the chin/neck.The uddiyana bandha is engaged by pulling in the stomach, trying to pull the belly button in toward the spine. Jalandhara bandha is engaged by tucking the chin and lifting the sternum, feeling the throat pull back toward the spine. Engaging the mula bandha stops the energy that is naturally flowing downward and out of the body, channeling it back up and into the body to be used. Engaging the uddiyana bandha keeps that energy flowing up and into the chest; engaging jalandhara bandha stops the energy at the throat, like putting a cap on a bottle. The effect is that energy swirls around in the body in ways that normally don’t occur. There are a wide variety of reasons that this is a positive thing. Practitioners of kundalini yoga work intensely with this energy both physically and spiritually. What interested me most in the bandha discussion was that Alexis mentioned how people who move their bodies with a lot of grace and strength are using their bandhas. I know this is true in yoga: engaging a bandha in a pose, or not doing so, has a big effect on my energy level while holding that pose; I can hold a pose longer and stronger if I’m using my bandhas. However, Alexis also related this to other disciplines like dance. One of the other students who had a dance background said that this is totally true and ballet dancers are constantly “pulling up” in order to move the way they do; she said that, when a male dancer lifts a woman, she’s so “pulled up” and strong through her core that she’s practically holding her own weight. I’d imagine that bandhas are used in other physical areas as well, like sports and martial arts, even if they’re not called by that name. On the drive home, I found myself singing along with the radio and realized that I had my uddiyana bandha engaged! Not with the full stomach scoop shown in the link above, but still, more than just tightening my abs. As soon as I noticed, this began to make perfect sense – I had some training as a singer when I was younger, and that core strength is so important to holding and sustaining a note; it makes sense too from a yoga theory perspective, because the uddiyana bandha channels energy upward, just as the singer is channeling breath and sound up and out into song. Of course the voice will sound stronger and purer with the energy generated by uddiyana bandha fueling it! I was so excited. I hadn’t thought of this when I was learning about bandhas in my YTT; it was Alexis mentioning how bandhas are used in other fields that made me notice. Now I have a stronger understanding of what uddiyana bandha is and what it does in the body. 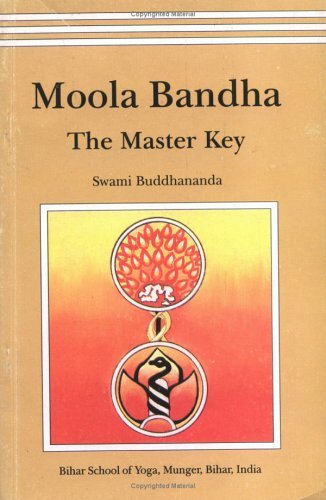 Moola Bandha: The Master Key describes a system of muscle exercises and locks that lead to a release of pranic energy in the body and ultimately to spiritual enlightenment. Swami Buddhananda defines a “bandha” as a bind, restraint, or lock. The idea is that “by locking or contracting certain muscles on the physical level a subtle process of ‘unlocking’ goes on simultaneously on mental and pranic levels” (2). By working with bandhas in conjunction with pranayama breathing exercises, a variety of physical benefits are said to occur, calming the heart rate and blood pressure, harmonizing the function of bodily systems, and creating a sense of relaxation. Bandha practice is also said to improve flow of pranic energy in the body, activating the chakras and leading to the release of kundalini energy and to heightened states of consciousness. The most important of these muscle locks or bandhas is moola bandha, or perineal contraction, the subject of this book. “Moola” means root or foundation, and moola bandha refers to the contraction of the muscles at the “root” of the spine/trunk at the perineum. The physical contraction of moola bandha is useful in treating problems of the lower abdomen such as digestive or sexual disorders. However, moola bandha also involves a spiritual/psychic contraction of the mooladhara chakra. This has the effect of activating our latent sexual energy and channeling it upward for spiritual awakening. The first half of the book gives background on bandhas and moola bandha in particular, as well as on mooladhara chakra and kundalini energy; it situates moola bandha in the context of ancient scripture, discusses physical aspects and pranic effects of moola bandha, and describes how moola bandha can be used in a therapeutic context. Thus prepared, the reader can move on to the second half of the book, which details several practices of moola bandha, including specific instructions and illustrations. This provides the real meat of the book – everything that came before is simply building to this point. The section on practices opens with techniques appropriate for any beginner, then moves on to gradually more advanced techniques as the aspirant progresses in her practice. Attention is paid to the anatomic differences between men and women as applied to the practice of moola bandha, making this book a good resource for truly any spiritual seeker.